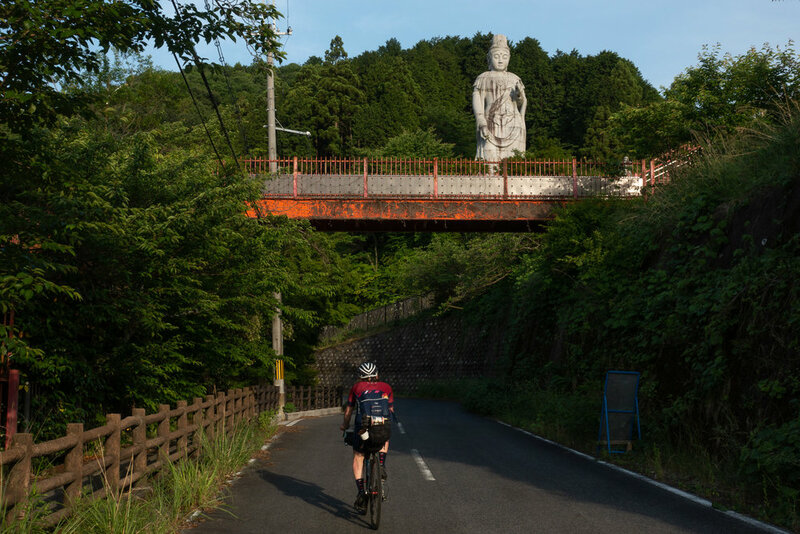 In part two of his three part series on bikepacking Japan, our own Chris Burati recounts the beauty of some of the best climbing in Japan as well as a onsens, Kyoto, and wild monkeys in a travel journal style reminiscent of Matsuo Bashō. This series was supported by our friends at Garneau who are also major supporters of Team To Be Determined. We awoke to yet more lawn mower birds. Joe and I quickly broke camp and set off while Bryan and Parker made coffee and noodles. They were the fast riders of the trip so Joe and I preferred to get a head start at our mutually agreed on slower pace. We searched and searched and searched, but never did find Wakahara Falls. More short forest road climbs and descents until we rolled down into Iida City and to a local grocery store. This was our breakfast and supply for the day, and we were an instant curiosity to the Fresh Market staff. This curiosity turned to friendship, which culminated with the gift of a bag of Asian oranges meant to ward off illness, and a picture we took with the employees, complete with the iconic Japanese peace sign because that’s a picture “in the Japanese way” they said. While at the market the gray sky we had been riding with gave way to drizzle and then to light rain. We hurried on to our first and only real climb of the day - a long, scenic forest road winding us along a mountain ridge and to the onsen. Throughout the trip my companions and I discussed which climbs were our favorite. I fondly remember four of them including this one, which probably stands as the most zen for me. No cars, gentle rain, cool temperatures, beautiful rainforest, and the promise of a hot bath, our first in days, sealed it for me. It was also comparatively short, which for a non-climber such as myself, was welcomed after the previous days’ voluminous elevation profiles. We descended a little ways onto a main road and saw a wood shop and showroom across the street. It was 2 pm, we were done with the day’s riding, and our check-in time for the onsen wasn’t until 3 so we went in. Kiijiya Yamato Rokuro Woodworks makes high end custom bowls, plates, and other household items, and the showroom is run by the most lovely woman named Toshiko. Toshiko wasted no time in ushering us into a side room where she sat us by a wood stove and served us Japanese green tea and snacks. Her English was good, and we told her of our journey and she gave us a tour of the showroom and house. With our bodies warmed and our check-in time fast approaching, we bid Toshiko a fond farewell. Fukinomori or Forest Hotel Fuki is something out of a picture book. It sits in a valley nestled among trees with outdoor and indoor pools. The rooms are of the traditional ryoken style as is the restaurant. We stayed in a large room with just closet space, tatami mats, and a sink. This is all we needed after three days on the road. We laid out our gear to dry, and dressed ourselves in yukatas (a type of kimono), and made our way to take onsen. All of this after we found and heavily used an Asahi tall boy vending machine. Yes, Japan has beer vending machines including on the streets of larger cities. We never saw any stigma around public drinking. Japan’s natural hot springs are said to contain minerals with healing properties, and between my increasingly severe sunburn, budding knee pain, and aching back, I was in need of all the healing minerals I could get. We left the yukatas in the changing room and showered at a wood-stooled seated shower station located next to the indoor pool. The combination of soap, shampoo, and hot spring water was magic. We moved from the indoor pool to the outdoor pool where we sat among the trees while a cold gentle rain fell. It was the personification of peace. I never wanted to leave. A traditional bento dinner followed with sushi, noodles, and other Japanese fare along with sake and more beer. Sleep soon followed after an aborted attempt at taking another onsen - our bodies needed rest. The ride to Gifu, our first major city since Tokyo, was marked by rolling hills among fjords painted in the colors of Norway. We pedaled until our route took us to large gate next to a hydroelectric plant. The road was closed and our efforts to translate signs failed. After speaking with a nearby maintenance crew we still had no clarity as to what lay after the gate and what to do. Do we proceed on per our planned route? Do we backtrack and climb up and around? If we pass the gate do we ride one mile? 10 miles? Is the road washed out at some point? Is there a military base? Will the Japanese Defense Forces arrest us? We had many questions, but only one clear answer - press on. We teamed up and managed to lift the bikes over the gate, which was no small feet considering Parker and I had to hoist Bryan’s 70 pound beast up and over. Thankfully we weren’t crushed in the process. It was soon clear this perceived damn maintenance road hadn’t been used or maintained in at least a year. We rode along the river as the rock covered pavement turned to leaf and rock covered pavement and then to mud and leaf and rock covered trail. It was now clear that this route hadn’t been used in excess of a decade, and we were likely the first humans to pass through in as many years. Aged warnings and street signs provided an erie glimpse into what post-apocalyptic Japan might look like. A wild boar ran alongside me and a giant snake crossed in front. We pedaled for miles crossing back and forth over the river using small bridges, hoping that this was the right way and that the road continued to exist up until our connection to Gifu. After a brief delay for a flat Parker suffered (little did we know this was the beginning of a host of wheel and flat issues) we made our way out. The road ended up being at least 10 miles long, and had well turned into a forest trail around mile three. The ride into Gifu was forgettable. A highway congested by rush hour took us past endless strip malls, and eventually to the outskirts where we had a decent meal at a somewhat seedy local establishment. We needed a place to camp. We came upon a soccer field next to a major road. Why not camp there? We did. I awoke to a fairly wet tent and blanket. The dew was so thick on the soccer field it was as if it rained overnight. Leaving Gifu reminded me of riding out of Phoenix. Main roads lined with strip malls and stores lasted for miles as we moved closer to the next mountain range. The haze was heavy as we made our way forward. Parker’s wheel and flat issues worsened upon the realization that their front rim was dented on both sides in two different areas - they needed a bike shop. We stumbled upon a tiny shop near the Gifu outskirts, and the owner helped us sort out some of the minor bike issues we had and gifted Parker a spoke wrench. A beautiful Keirin frame sat on display in the shop and the owner told us it was his friend’s, a major Keirin racer out of Gifu. Our ride to Kyoto was long, but comparatively flat. Before reaching the southern edge of Lake Biwa, which we would follow until our last climb before Kyoto, we rode through the small town of Sekigahara. “Do you guys know where we are? !” I exclaimed. We were in the town where 418 years prior, the Battle of Sekigahara was fought. The Battle of Sekigahara is widely viewed as the beginning of the Tokugawa Shogunate, the last to control Japan before modernization. During the battle Tokugawa Ieyasu led an army against a numerically superior force helmed by Ishida Mitsunari and emerged victorious. If you’re ever in Hikone, stop by Void a Part, a small coffee house geared towards the artistic community and located next to Lake Biwa. Part eclectic used bookstore, part camera museum, part coffee house we sat in comfortable chairs and drank single origin cold brew. A welcome oasis after riding for hours in the beating sun once we left Sekigahara. Soon Lake Biwa was behind us and we were in Otsu coming up to the last ridge crossing before dropping down into the valley where Kyoto sleeps. After a short punchy climb up Mt. Hiei, our only real climb on the day, we screamed straight down the other side and right into Kyoto. By now our gear was ripe. We had another airing out session in the ryoken. Riding gear was hand washed in the sink, and camping gear was laid out over the bamboo fences in the courtyard. After a dinner of brothless noodles we were asleep. Ready for our first and only rest day in Kyoto. We toured the former imperial capital of Japan with Joshua, an American expat and architect turned bike tour owner. 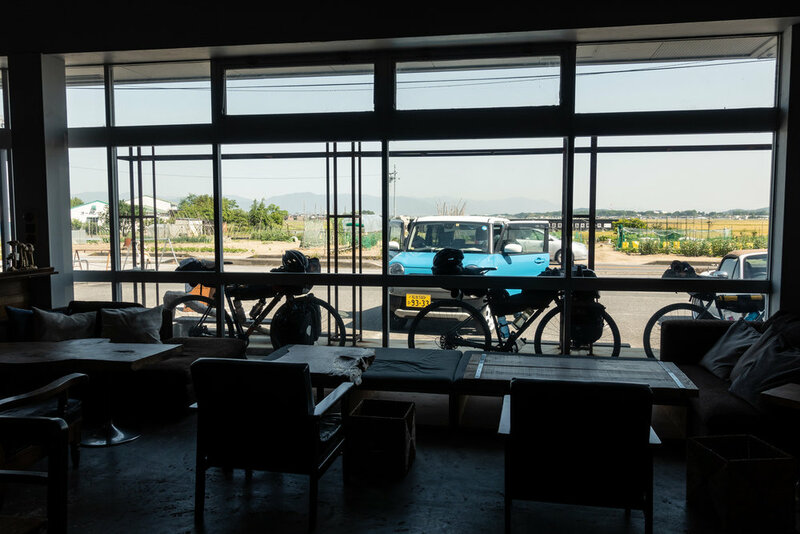 If you’re ever in the area, and want to see Kyoto and the surrounding area by bike, check out his company Noru Kyoto. Joshua was gracious enough to spend his day off showing us some of the more traditional attractions in Kyoto as well as others that were off the beaten path. The tour done, we were eager to not be riding bikes. Parker needed their front wheel replaced, which he took care of, and I was convinced to seek out the nearest Bic Camera to buy a Ricoh GR II (newsflash, they aren’t cheaper in Japan and I did not impulse buy one). We bought some beer at a nearby vending machine, and watched the sunset on the banks of the Kamo River. A dinner of Japanese curry at what seemed like a small one room apartment followed with the now customary second dinner at Family Mart. We met Joshua and a few of his expat riding buddies at the entrance to Fushimi Inari-taisha. Fushimi Inari, famous for the orange gates that extend two and a half miles up the mountain, is devoted to the kami, Inari, the patron of rice and business in Shintoism. After a quick tour, breakfast, and re-supply at 7-Eleven we were on our way. We made a short visit to Nara, and stopped by the famous wild deer park where we observed Japanese deer behaving in the opposite fashion to that of their North American cousins. They were aggressive, unphased by people, and eager to eat the biscuits you could buy for several yen at a stand out of your hand. After Nara we parted ways with our new found riding friends, and we were back to a foursome climbing solitary mountain roads. I probably fared the best out of the group as things seemed to go wrong for everyone. Bryan had flats, Parker’s disc brake holder was mangled during the new front wheel install and was creating all sorts of friction and rubbing issues, Joe’s seasonal allergies turned into a full blown sinus infection (he never complained once even though it plagued him the whole trip), and then Bryan suffered an allergic reaction that left his face puffy and red and hives all over his body. To add insult to injury, we ended up having to climb our steepest pitch yet in a park that winded up towards an orchard. It was a brutal double digit gradient that seemed to last forever. On heavily weighted bikes our legs screamed as we weaved from side to side, the only option being up. The sun was scorching and the path devoid of shade. We soon descended into a little tea shop where we stopped for tea, water, and snacks. It was a nice boost to morale on a day where we were all suffering in our own small ways. We rode up and down countless more mountains until we were close to our wild camp end point. The sun had set and we were alone on the side of a mountain searching for a clearing and/or flat ground, headlamps alight. Ever the personification of Lewis & Clark, Parker found a flat spot up a stupid steep gravel climb. The climb was so steep we had to push our bikes up it. The top did not disappoint. A nearly full moon cast light over an abandoned house in the midst of a bamboo grove. This was perfect. As we set up camp and made noodles, a lone monkey screamed at us from the grove. We wondered if it was a mating call, if he was angered at the intrusion of humans, or if he was just being a jerk. The cry grew more and more distant as we ate our noodles and rested our heads until there was only silence. I classify Day 8 as one of the hardest for me as well as the day with perhaps one of the best endings. We didn’t know when our next resupply was, which comes with the territory. I had just enough food for a small breakfast and small snack before we hopefully hit a convenient store. Part way on we had to bushwack through an unknown forest hoping the hike to the road wasn’t for miles. Up the side of a cliff so steep I could barely climb up it with my bike, through an orchard, and back onto the road, I was suffering. Bryan crashed hard on a descent shortly thereafter, and I forgot about the hunger and felt only thankfulness that he was okay. For perspective, if he had hit the guardrail a few feet to the left he would have plunged of the side of a mountain to his likely death. A woman took pity on us after she drove past on one of our endless ascents. As we descended back down getting ready to go back up again, she flagged us down in front of her house holding a bag of cold Pocari Sweat. We gladly accepted the offering. Twenty eight miles and 5,000 feet later I was approaching a dire bonk situation. One of those bonks that you never forget. Unlike a friend and teammate of mine who once laid down on a bench in the middle of a training ride and waited for the bus to take him back to the city, I had no such option. We were in remote mountains. Then, like magic, we were in Koyasan and surrounded by American tourists. We picked the first restaurant we saw, and came in hot. We looked and smelled terrible, but we didn’t care. We ordered one of everything on the menu then went to Lawson’s (or was it Family Mart?) for second lunch and our first and only resupply before our destination, the Wakayama Ferry Station. Parker crashed heavily on the descent coming out of Koyasan. Their hand was opened up and he had respectable road rash down one side of his body. There was nothing he could do until Wakayama other than grit his teeth and pedal on. Wakayama welcomed us at dusk. We changed in the ferry terminal and ordered beers and ramen in the adjoining restaurant. Truck drivers sat around us puffing on cigarettes. The two hour ferry ride was pleasant and we drank more beer, ate ice cream, and then eventually passed out. After disembarking we rode for 20 or 30 minutes, including up yet another climb until we came to the Pacific Ocean. We set up camp and fell asleep with only the sound of gently crashing waves in our ears.